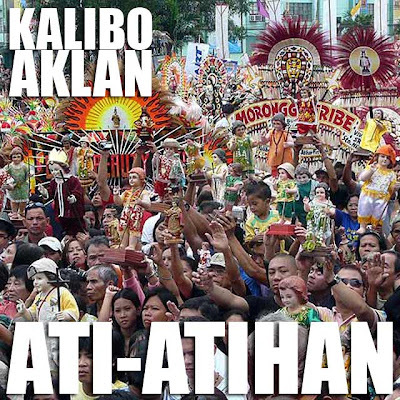 Aklan: Kalibo's Ati-Atihan Festival! Viva Señor Sto. Niño! 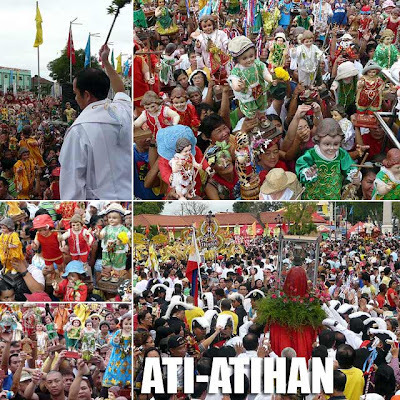 The Ati-Atihan Festival of Kalibo, Aklan is held during the third Sunday of January, the feast of the Sto. Niño. This year it was held on January 17, 2010. The day starts at 6:30 a.m. with the transfer of the Sto. 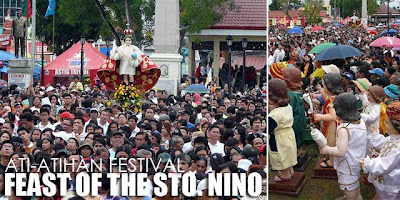 Niño from the Kalibo Cathedral to Pastrana Park. This was followed by a Mass at 7 a.m. You'll have to wake up really early for this. The only downside was that it would drizzle every now and then. Good thing it didn't rain hard. One thing I noticed during the Mass were the dozens of Sto. Niño images in front of the altar. I found it amusing that people treat the image like a doll since vendors all over the place sell various clothes for the Sto. Niño images. As the Mass was about to end, people started raising their own images of the Sto. Niño since priests went around to bless the images with holy water. The different tribes were assembling around the plaza as well during the Mass. I could see them amongst the crowd from my vantage point in the altar area. As soon as the Mass ended and the crowd shouted praises for the Sto. Niño, "Viva Señor Sto. Niño!" the drumbeats from the different tribes erupted. It was an exciting feeling and the atmosphere was simply electric as one by one, the tribes began to leave the plaza to make their rounds around town.